Tom Sorel (seen above), director of the North Dakota Department of Transportation, plans to retire April 26 from his position. Ron Henke, the agency’s deputy director for engineering, will serve as interim director until a permanent director is named. Appointed as North Dakota DOT’s director by Gov. 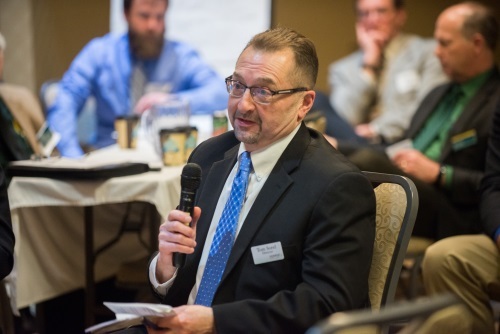 Doug Burgum (R) effective August 7, 2017, Sorel previously served as chief operating officer of the Minnesota Trucking Association and as Minnesota’s transportation commissioner from 2008 to 2012. Prior to that, he spent 30 years with the Federal Highway Administration, serving as administrator of its St. Paul Division from 2005 to 2008. Sorel – who maintains a residence in Minneapolis and has a son entering his senior year of high school there – said in a statement that “it’s with mixed emotions” that he’s retiring from public service. “I have thoroughly enjoyed my time as director. The North Dakota DOT is a wonderful place to work with a team that is second to none, and I’ve always felt a deep sense of pride here,” he explained. During his 20-month tenure as North Dakota DOT director, Sorel helped lead launch and implementation of Vision Zero; a comprehensive, multi-agency effort between his agency, the North Dakota Highway Patrol, and North Dakota Department of Health, with the goal of continually working toward zero motor vehicle fatalities and serious injuries on North Dakota roads. That effort is credited with helping spark a decrease in North Dakota motor vehicle crash fatalities, which declined to 104 in 2018; a 10 percent dip from 2017 and the lowest fatality number for the state in a decade. Under Sorel’s leadership, the North Dakota DOT also implemented kiosk service for renewing motor vehicle tabs at several locations across the state, a Track-A-Plow pilot project for tracking snowplow locations, and helped develop its “Statewide Active and Public Transportation Plan,” better known as ND Moves.